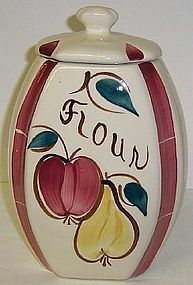 This really nice Fruit decorated FLOUR Canister and Lid were made by Purinton. 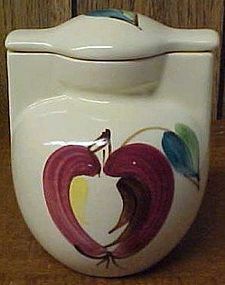 This Canister is signed Purinton Slip Ware. It measures 8 3/4 inches to top of knob and is in very good condition with no chips or cracks. The hand-painted decoration is all very good. Be sure to search our other Purinton available. We guarantee all items to be as described. Feel free to email any questions. THANK YOU. 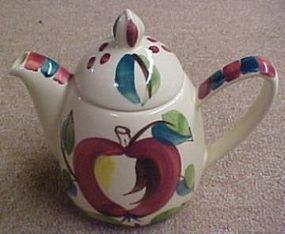 This really nice Apple Teapot and Lid were made by Purinton. The Teapot is signed on the bottom Purinton Slip Ware. The Teapot bottom and lid are both in very good condition with no chips or cracks. The painted decoration is all very good. Be sure to search our other Purinton available. We guarantee all items to be as described. Feel free to email any questions. THANK YOU. 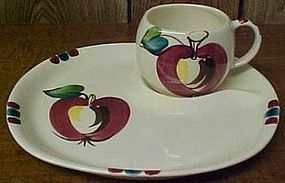 This Apple Snack Plate and Cup were made by Purinton. The Snack Plate is signed on the bottom Purinton Slip Ware Hand painted. The Plate measures 7 3/4 inches X 8 1/4 inches. Both the Plate and Cup are in very good condition with no chips or cracks. The hand-painted decorations are all very good. This is sold as a 2-piece set. Be sure to search our other Purinton available. We guarantee all items to be as described. Feel free to email any questions. THANK YOU. This really nice Apple Grease Jar and Lid were made by Purinton. Both the bottom and lid are in very good condition with no chips or cracks. The hand-painted decoration is all very good. The Grease Jar measures 5 1/2 inches to top of lid. Be sure to search our other Purinton available. We guarantee all items to be as described. Feel free to email any questions. THANK YOU.